Last week we had a cold spell out here in Phoenix and I decided to make some soup. Since I had a ham bone in the fridge from our Easter ham I thought I should use that. 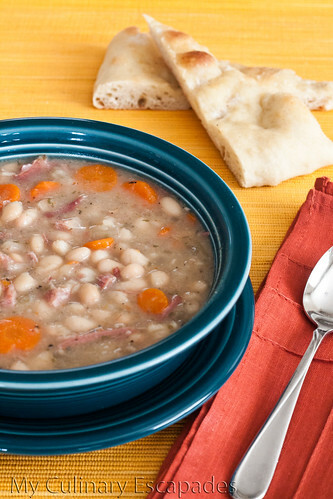 I love bean soups and will generally make up a batch of ham and white bean soup or pinto beans with my leftover ham bone. This soup is warm and it takes very little preparation to get it going. So many simple ingredients combined to make a flavorful and delicious soup. Pair this soup with a simple pizza crust brushed with olive oil and sprinkled with salt and pepper and you have one really nice treat for a busy night. There really is no substitute for warm bread and this pizza crust delivers. It is wonderful on the side or dipped into the soup. Soak your white beans overnight in 4-5 cups of water. I like to do this in my pyrex large measuring cup, so that they are ready to be rinsed and added to the crock pot in the morning. Chop the onion and put into a large crock pot along with 2 garlic cloves that are minced. Add all other ingredients into the crock pot and set it on high for 6-7 hours or low for 8-9 hours. Soup will be done when the beans are tender. Once soup is done remove the ham bone and take the meat off. The meat should be falling off the bone tender. Chop into bite sized bits and return them to the crock pot. Stir to incorporate. You will want to remove the bay leaf at this time as well. For the pizza crust I bought pizza dough from Whole Foods. If you have a Whole Foods in your area and you have never gone inside, go today. There are so many wonderful things in there, including pizza dough that is fresh. You take it home, let it rise and then make it into pizza crust. Such a simple and easy way to make a great pizza. Today I wasn’t making pizza but I wanted a warm bread with the soup. Rather than just serving the soup with bread I decided to stretch the dough, brush it with olive oil, and sprinkle it with salt and pepper and cook it according to the directions.